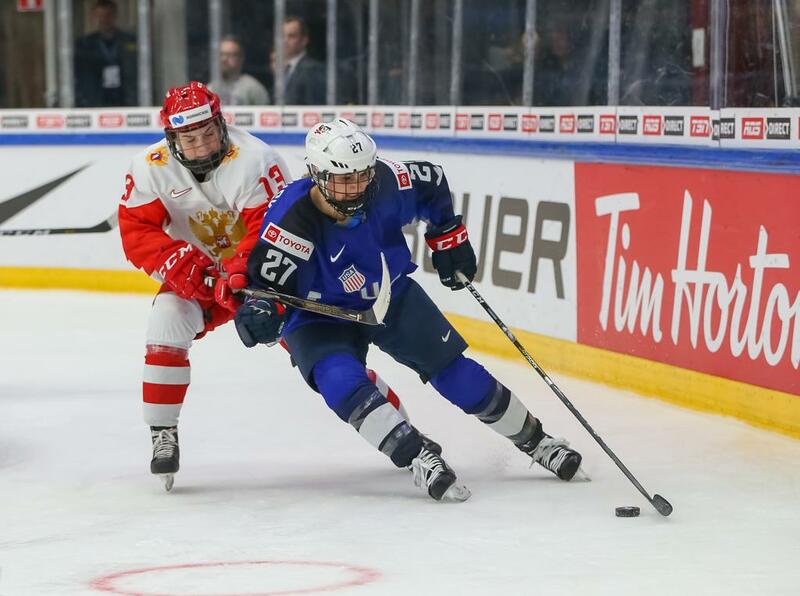 With the IIHF World Championship marking the start of the next Olympic quad, young talent has been on display for many teams in the tournament. Six 2018 NWHL Draft picks have been in action with their respective national teams, and each one made a profound impact during the group stage. Keller helped the United States finish group play with a perfect 4-0 record as she recorded two goals and two assists over the course of four games. She picked up an assist on a goal by Melissa Samoskevich in the first game of the tournament to help the United States take the win. Keller then stayed off the scoresheet in a crucial 3-2 win over Canada. The next day, Keller scored twice in an 8-0 rout versus Switzerland. She also recorded a team-high seven shots on net. Keller then rounded out her group play with an assist in a 10-0 win over Russia. Her assist came on a goal by BC teammate Cayla Barnes. Gabel scored three goals and added one assist in four group play games with Canada. In Canada’s first game, a 6-0 win over Switzerland, Gabel scored the opening goal of the game to give Canada a lead halfway through the first period. She then had two shots on net in a disappointing 3-2 loss against the United States. Gabel then had a dominant game during the last day of group play as she scored two goals and added an assist in Canada’s 6-1 win over Finland. Her first goal opened up the game and she later added her second goal and assist in the second period. Pankowski leads all NWHL draft picks in the tournament after group play with five points in four games. In the first game of the tournament, Pankowski got on the scoresheet for the United States with a late goal to extend the lead in a win over Finland. The next game, Pankowski scored the game-winner to take a win over rival Canada. Her goal came in the middle of the second period to give the United States a 3-2 lead that they would not concede. Pankwoski then capped off group play with three assists to help the United States take a commanding victory over Russia and end group play with four wins. Samoskevich picked up two goals for the United States over the course of four group play games. Her first goal proved to be crucial for the US in their first game of the tournament. She scored early in the first period to tie the game at two goals apiece. It was the first of five unanswered goals by the US. During the last game of group play, Samoskevich picked up her second goal of the tournament late in the game to extend the US lead over Russia to ten goals. Clark produced two goals for Canada in group play to help them to three wins in their four games. Her two goals came in the first game of the tournament in a 6-0 win over Switzerland. The two goals came about six minutes apart in the third period to increase Canada’s lead to 4-0. Pannek finished group play with two assists in four games. In a commanding 8-0 win over Switzerland, Pannek picked up an assist late in the game on a Megan Keller goal. She also had two shots on net and a plus-three rating. In the last game of group play for the United States, Pannek picked up another assist, this time on the game-opening goal just two minutes into the game.